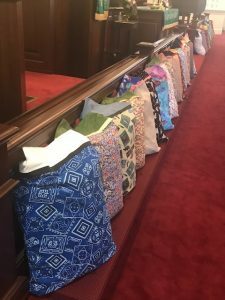 Thirty-five pillows were dedicated during the Sunday service on July 29, 2018. The pillows were given to Hopeful Horizons in Beaufort. We are hopeful that the pillows with the cheerful cases will give comfort to the recipients during their difficult times. The cases were made by members of the United Methodist Women under the leadership of Mary Ratliff. We wish to thank all those at BUMC for supporting this ministry with your prayers and gifts.